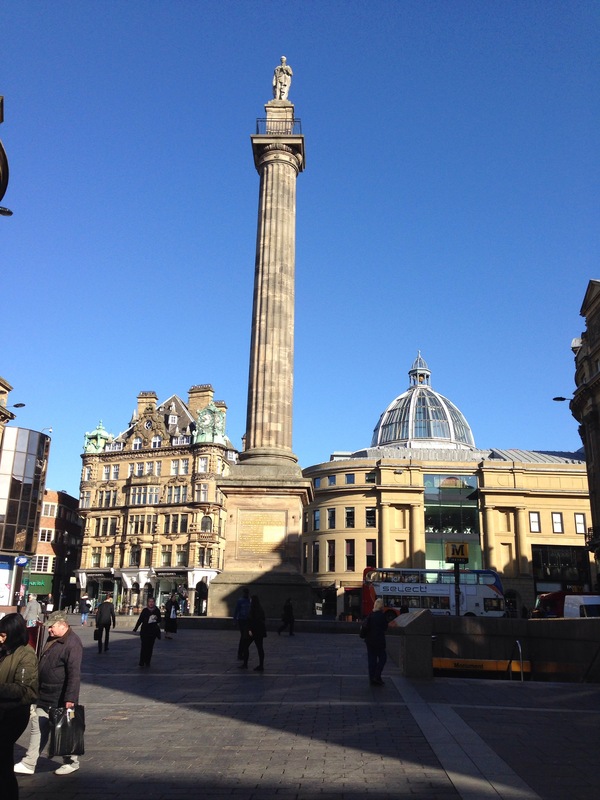 The spectacular Grey’s Monument that greets me on my journey to and from University. So, I am reporting back largely unscathed from my first annual PhD review. I say largely, as the small problem of the pretty ropey ‘methodology’ got in the way of a fully successful review. The good news was that my report was commended for the writing style, which I put down entirely to the practice I’ve had writing this blog. I took the photo above was after emerging from Monument Metro, following the review, and I thought the scene beautifully captured my mood – on the way in it had been grey and overcast so, in both cases, it was a perfect reflection of my emotional state. To celebrate the successful review I decided to go and read some of the original copies of the regional newspapers at Newcastle library. That’s one in the eye for those who say I don’t know how to let my hair down! I say original copies, because I realised that I had spent all my time so far using either www.britishhewspaperarchive.co.uk or microfilm at my local library. It wasn’t until the other day, during a particularly frustrating microfilm session where the print was too dark and poorly backlit that I suddenly thought, why don’t I just see if the originals are available and as luck would happen they were. The first thing that strikes you is just how large the publications are. Bound by year in huge tomes, you need a very large desk just to accommodate them. 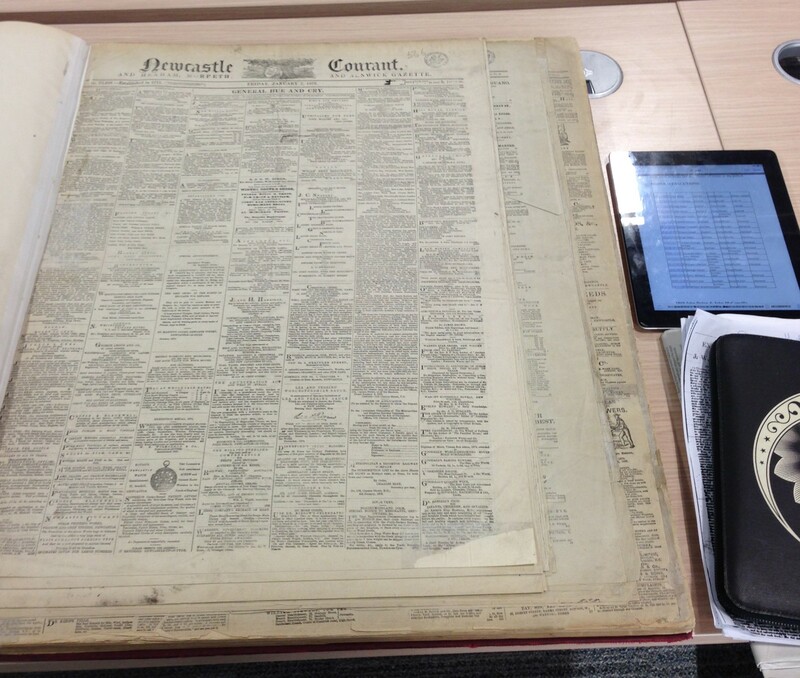 Newspaper versus iPad for size comparison. They are an amazing resource and incredibly fragile. The staff at the library told me that they’re under constant review as increasingly they’re too damaged for public consumption. So, it is a rare privilege to be able to read one, particularly knowing that it may be removed from circulation at anytime.I love a good newspaper and was particularly fond of broadsheets. I remember when the Guardian moved to its current ‘Berliner’ size, thinking it was a mistake, but now handling a broadsheet just feels unwieldy and i was reminded of this feeling looking at the Newcastle Courant (above). What is interesting about reading the newspapers in their original form as opposed to say online or on microfilm, is just how differently you read them. I mean this in a number of senses. The invention of OCR (optical character recognition) means that most online newspaper research allows you, with varying degrees of success, to only see the exact article/words you were after. Now, I am not for one minute saying that this is not a huge advance, believe me anyone who has spent 3/4 hours searching on microfilm for an article they hope might be in a newspaper, will testify to this. However, there are serious issues with OCR and the way we read newspapers online that a historian needs to acknowledge. What is so striking about having the whole newspaper in front of you is how much more considered your approach is to reading it. It is impossible to ignore the rest of the newspaper, the act of searching through it means you come across the other stories that are essential parts of the wider whole. More importantly you realise how a stories position in the paper gives an idea of its status in both the Editor’s mind and the readers perception. When you simply land on an article online it is all too easy to make assumptions without acknowledging the wider coverage in the paper and also the importance placed on this particular article in the grander scheme of the publication. This is particularly important for my studies as an execution report out of context online, has a lot more power than it does tucked away in a few column inches on page 4 of the regional publication. Also, one must always bear in mind how papers were consumed. We are so used to consuming our news in a sort of pick and mix fashion these days, in which we have instant access to a multitude of mediums, that one can easily forget the much more considered approach a reader takes to a newspaper and what that says about the way news may have been read or consumed. You must always be vigilant in acknowledging both the decisions you make in what sources you choose and in what sources you choose to exclude, as the selectivity of your sources will dictate your end product. If you don’t acknowledge your choices and justify them, then you are not presenting a fully fledged argument. Which brings me back to the methodology and the need to explain and justify my approach – must get on with that! Hopefully, normal subject blogging will resume again later this week. My comedy group, which takes up the time that the PhD doesn’t already fill, made our first official music video last month. It was for a great band called The Wave Pictures (Moshi Moshi label) and was really fun to do. We used our favourite local pub The Cumberland Arms and basically just spent two evenings clowning around. It was the perfect antidote to days on end reading about death. Enjoy. 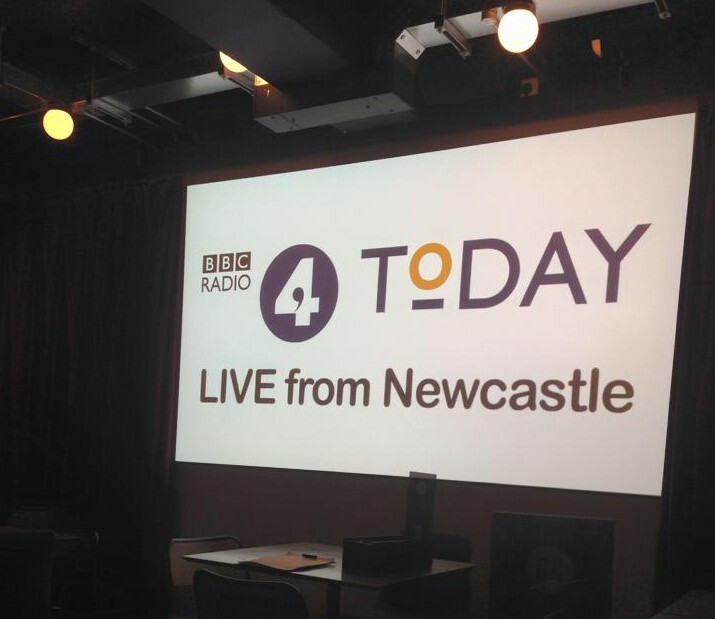 A friend of mine who works at Newcastle’ fantastic Tyneside Cinema kindly invited me to the live recording of BBC Radio 4’s Today programme. As it happens, this blog has been finished during the recording. As a big fan I was really looking forward to it, but after waking at 6am to get into town for 6.55am, I was dissappointed to realise that we would just be noise in the background and the show (as it was live) was not broadcast in the cafe, so I basically woke up to go and sit in a silent cafe – this was compounded by my friend sleeping in and not arriving till 7.30. In the end though it turned out to be worthwhile as my friend is a Sopranos fan and having finally finished the box set last night, we got to discuss the controversial ending for most of the remaining 90 minutes of the broadcast. The eerily silent broadcast of Radio 4’s Today programme.